Last night was awesome. bring on Sat night. WOW... What a night! That was one of the best party's ever. HUGE. one of the Biggest nights of the year tonight so don't miss out. come have some fun at the Loft cause you can't beat the party atmosphere down there. cheers! 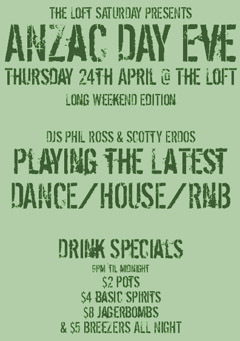 Loft it up tonight party animals. going to be an awesome night. can't beat it. 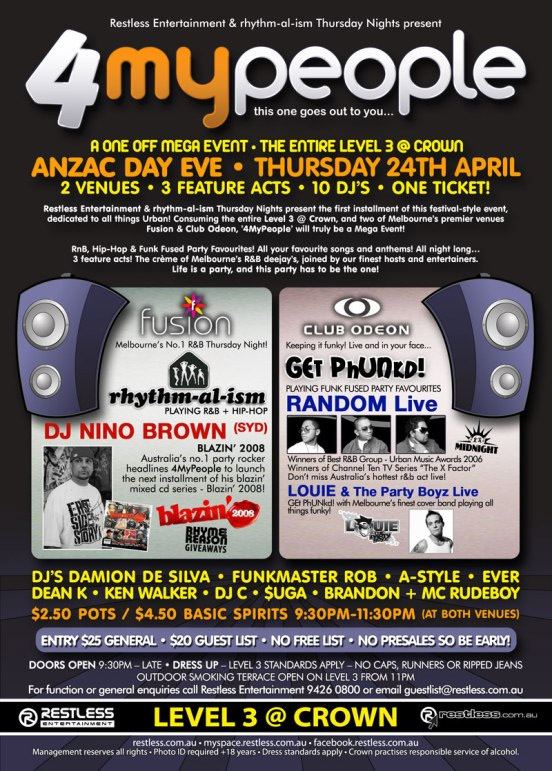 Its going to be big in the CBD & Crown tonight! CBD: Our Loft guestlist for tonight is already bigger than on a big Saturday, Billboard is always packed on public holiday eves, and the Euro Bier Café has a great line-up. 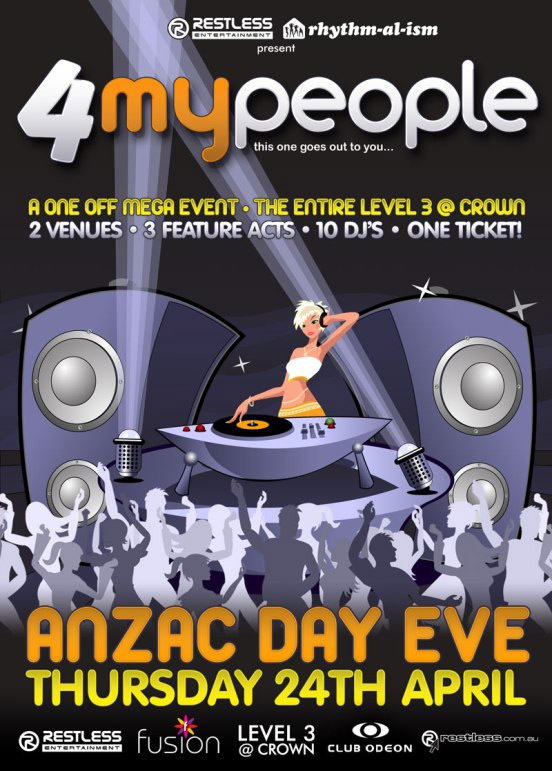 Crown: The Restless crew are running one of the biggest RnB events ever, using both Fusion and Odeon for “For My People”. All the popular Thursdays will be packed and it’ll be interesting to see how The Wheelers goes with its relaunch. GUYS and girls, by popular demand, we’ve found you a ladies night! 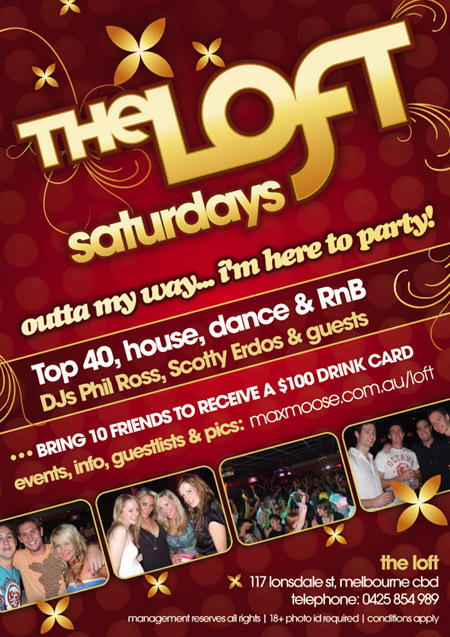 This Saturday at The Loft. Girls need to register right now! Details and registration here. The guestlist is also running as normal (its close to the biggest ever). 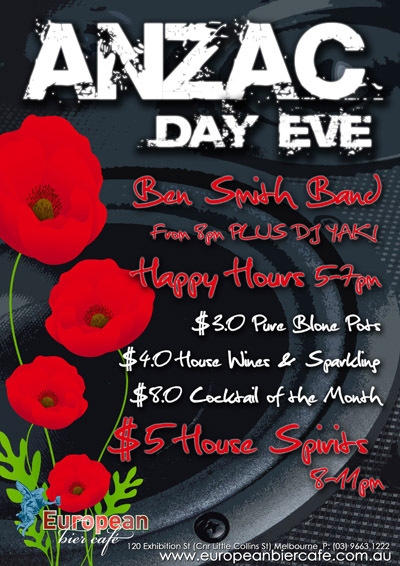 Thu: Loft, Fusion/Odeon or Euro Bier Cafe. Fri: The Drink or DysFUNKtional. Max Moose is assisting with the publicity for the 50 Cent tour. 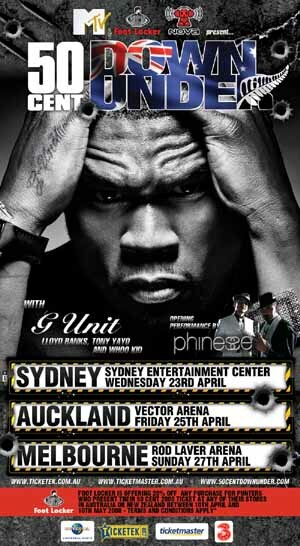 Its in Melbourne this Sunday April 27. Check out the MySpace and poster below. 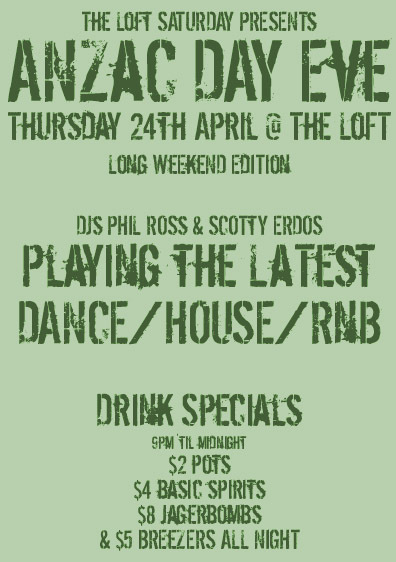 You can win tickets at The Loft tonight and on Saturday. Work parties, birthday parties- its on. If you need a venue, we’ll help. See Loft’s ad or Velour’s ad or our Functions/Birthdays page. Nightclub bus tours are a lot of fun. A bus, your friends, four clubs and competitions. You’re all on a bus, so nobody has to worry about driving. Its a great night out. See our bus tours page. Bus Tours, Club Chat Room , Gossip, E-Group, Guestlists, Photos, Reviews, Club Profiles, Cover Bands, Nightclub Sites, Club Search, Features, Tourist Guide, MaxCards, Classic Songs, Cocktails, and funny SMS. 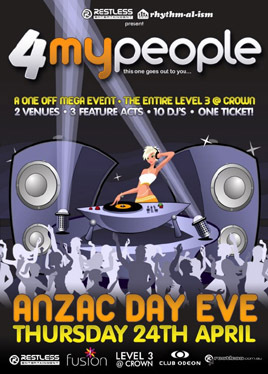 If you are looking for something different this Anzac Weekend. There will be a live latin band and DJ playing RnB, House and Reggaeton. This event was a FULL HOUSE by 11pm last time. So be sure to arrive early.